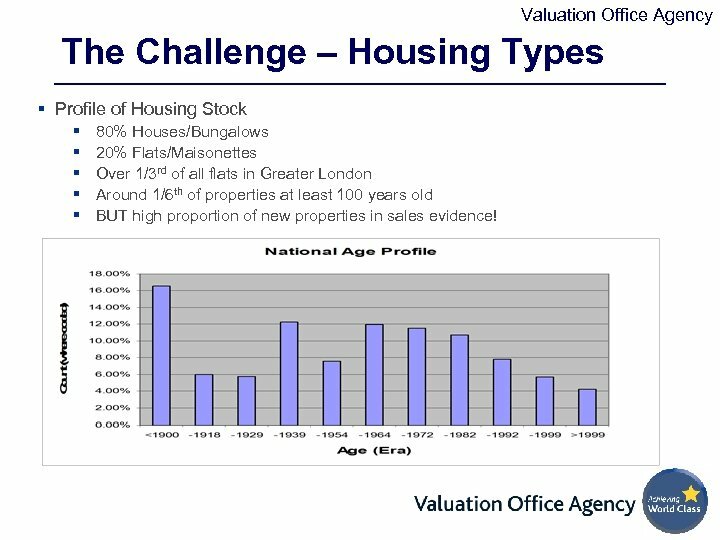 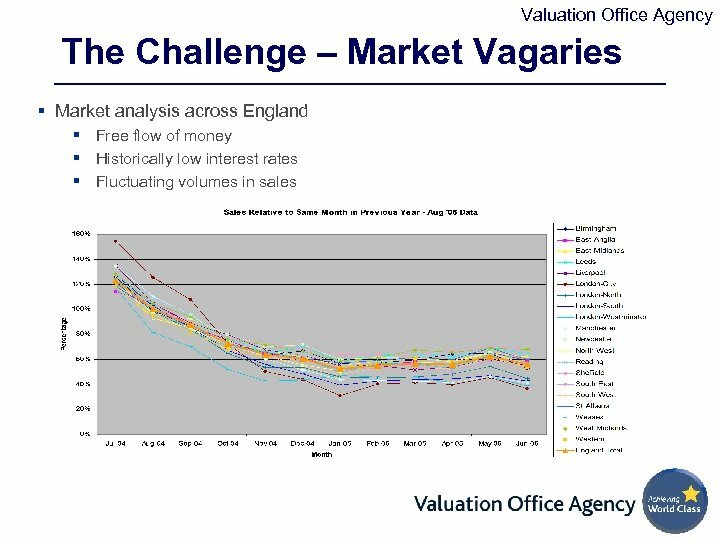 Valuation Office Agency The Challenge – Housing Types § Profile of Housing Stock § § § 80% Houses/Bungalows 20% Flats/Maisonettes Over 1/3 rd of all flats in Greater London Around 1/6 th of properties at least 100 years old BUT high proportion of new properties in sales evidence! 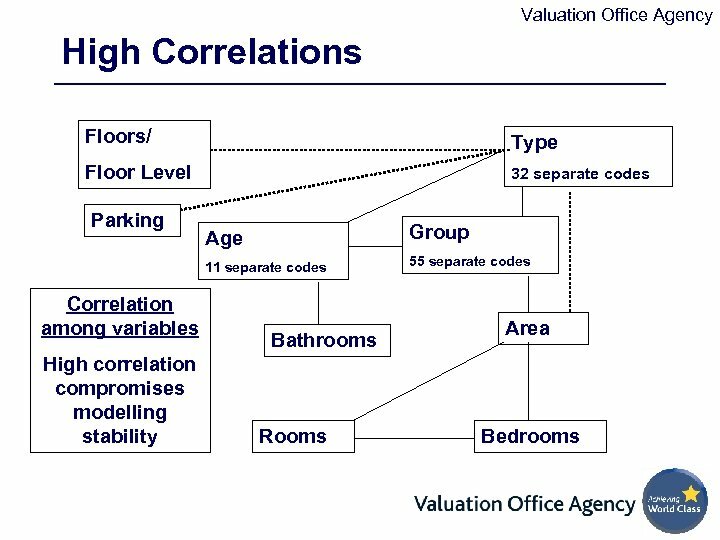 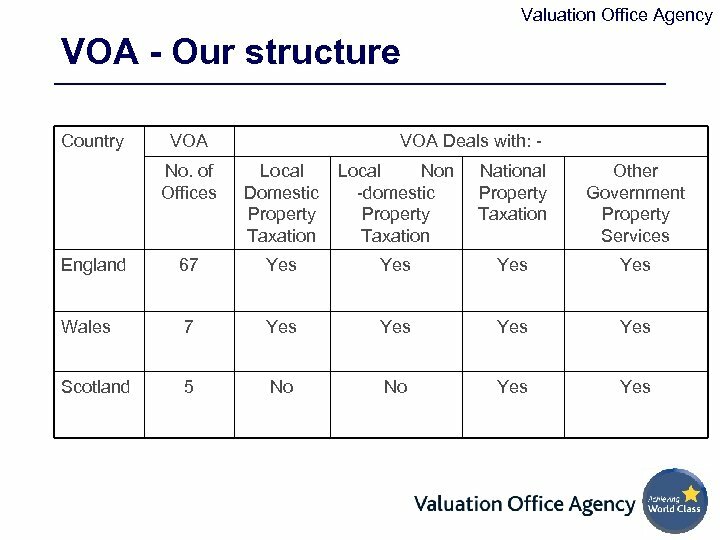 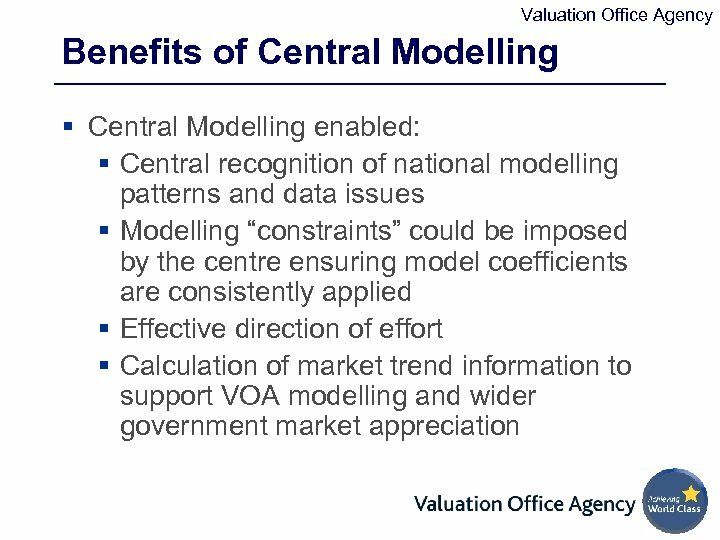 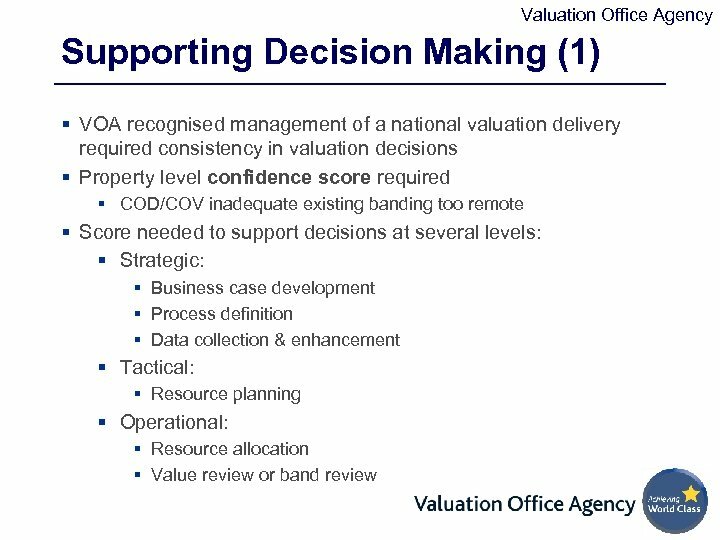 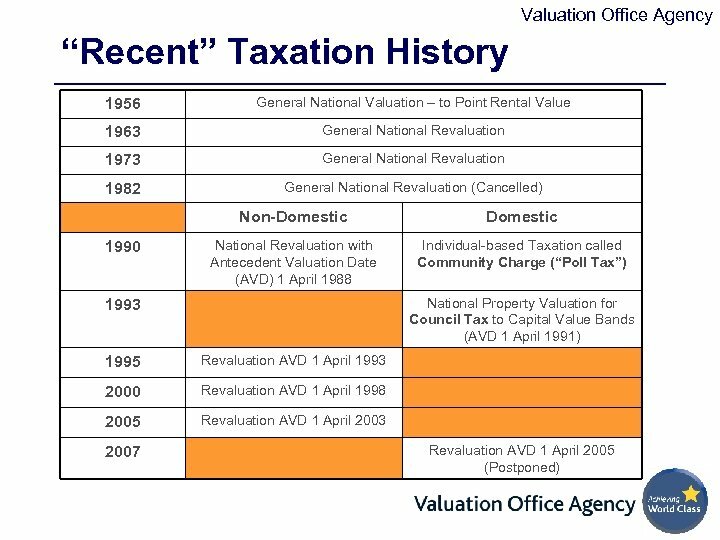 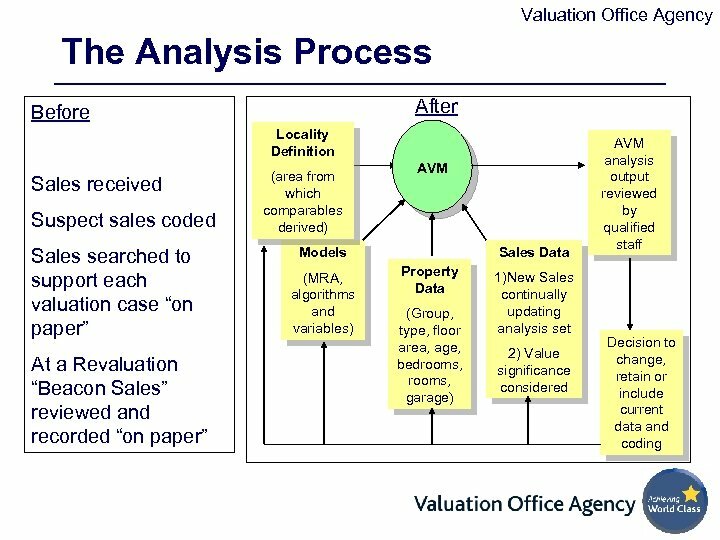 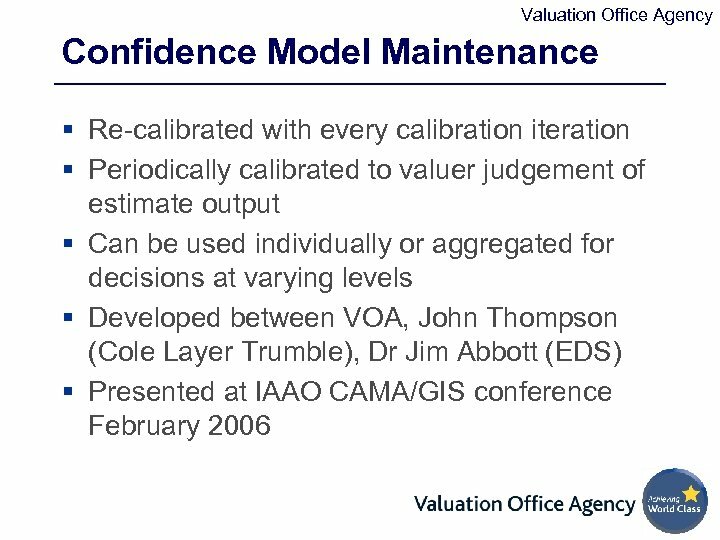 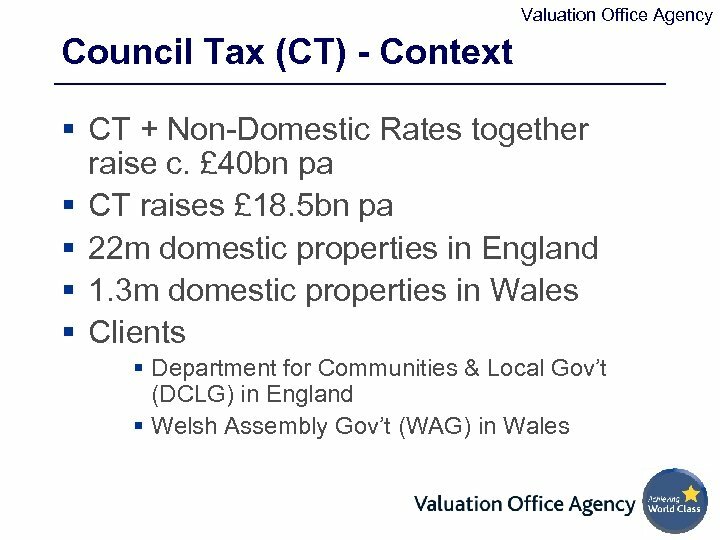 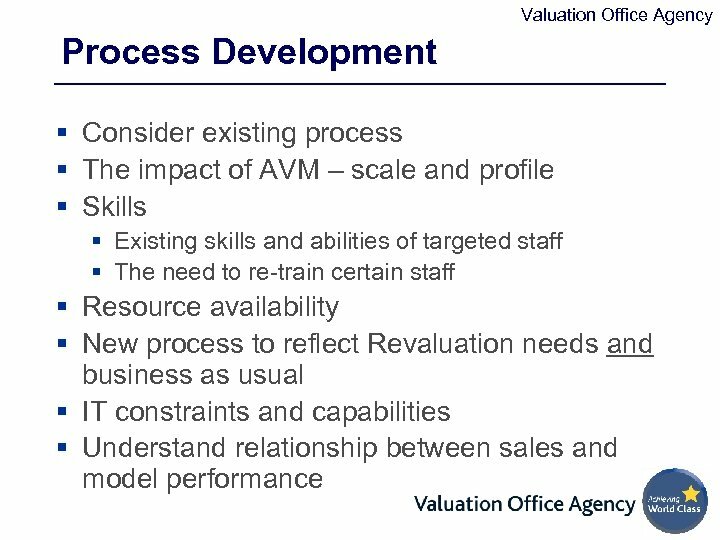 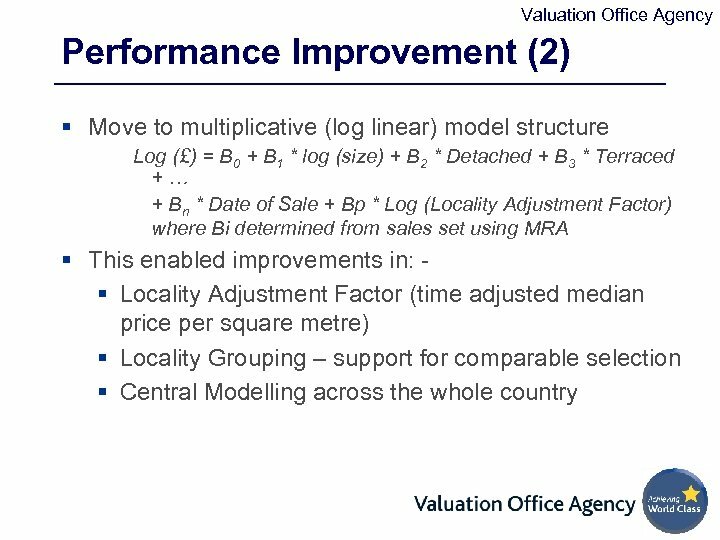 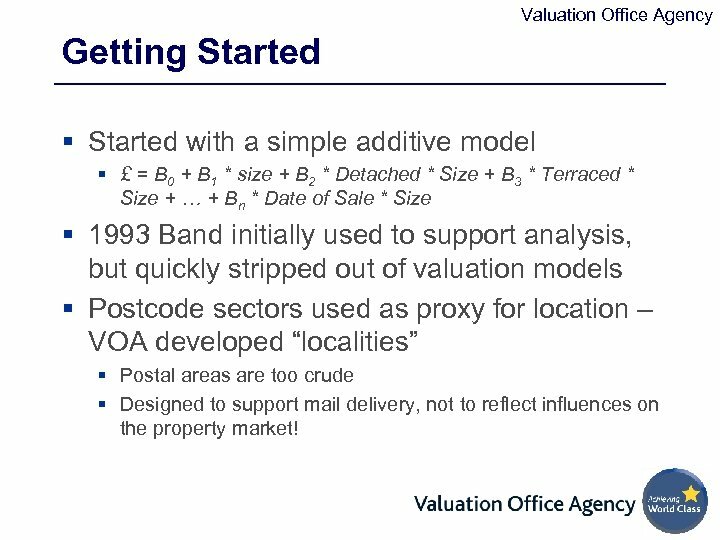 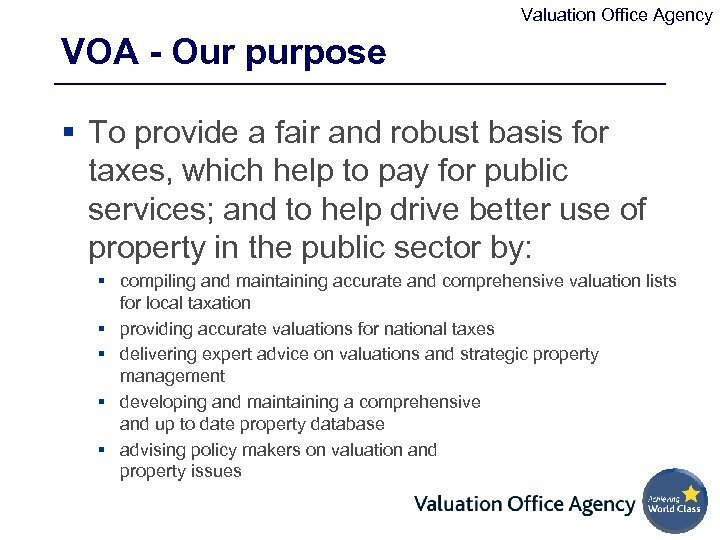 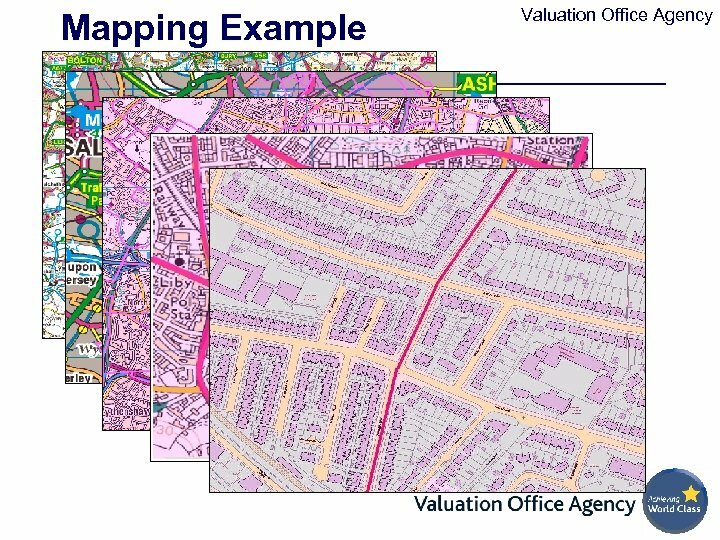 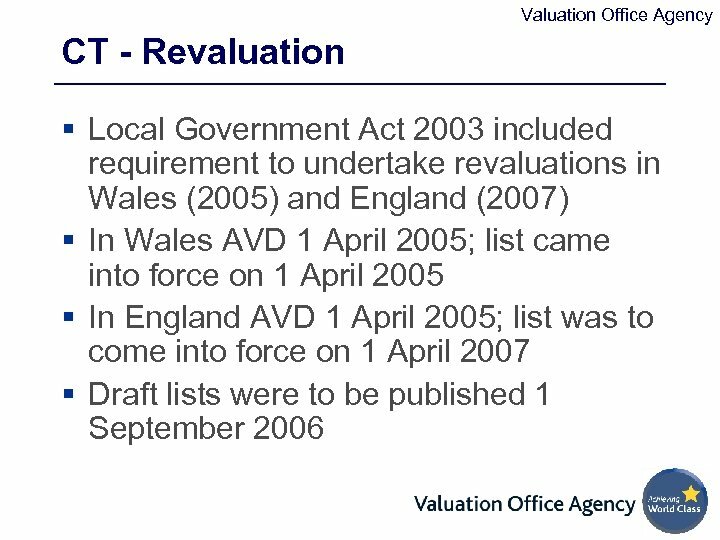 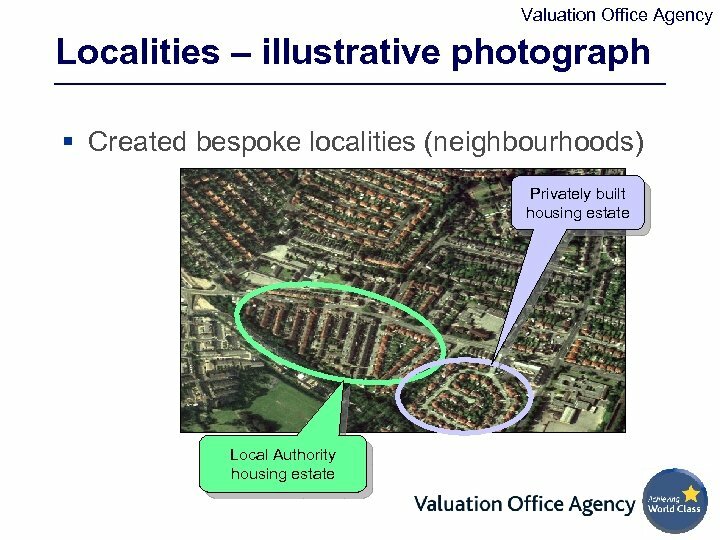 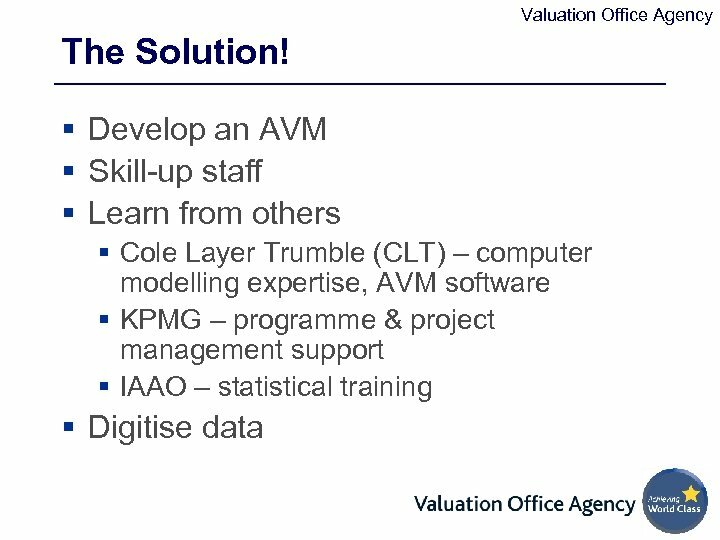 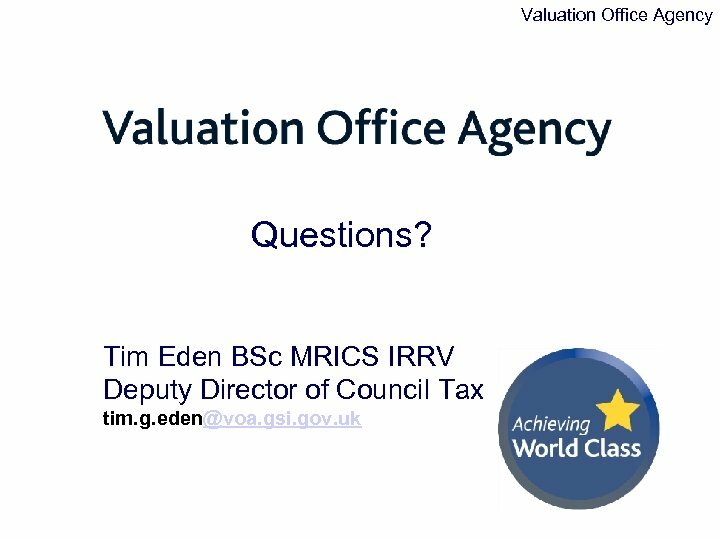 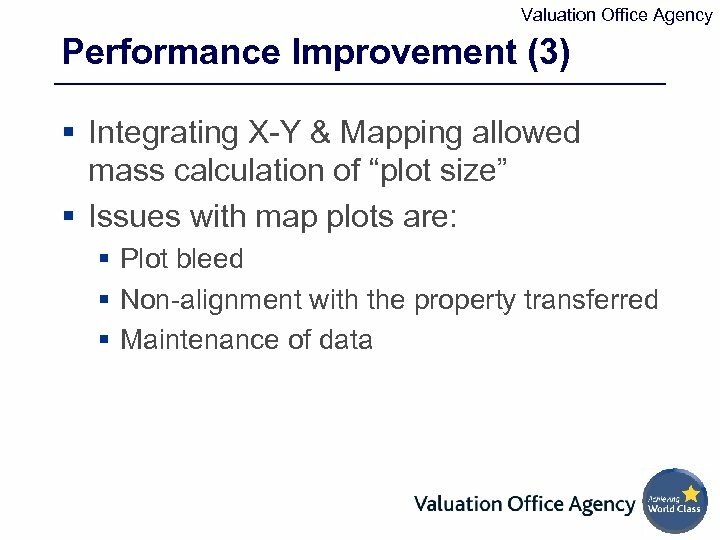 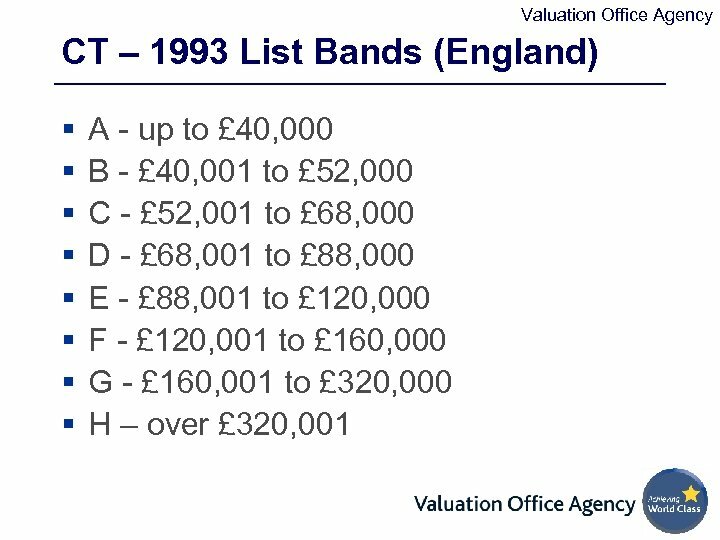 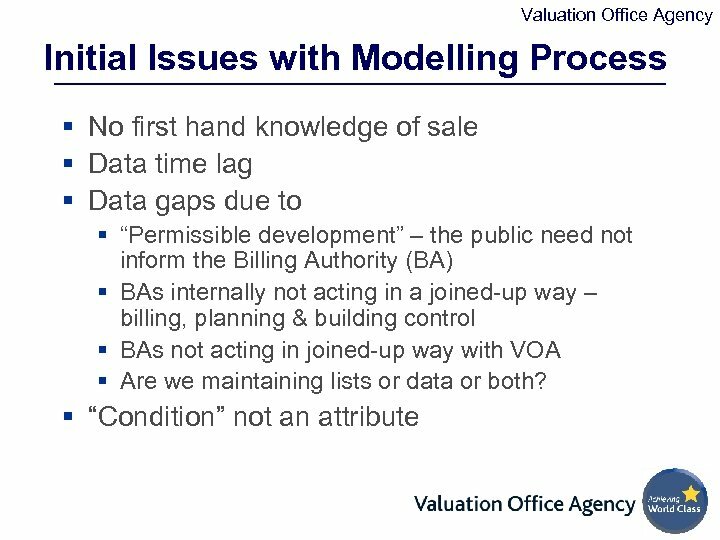 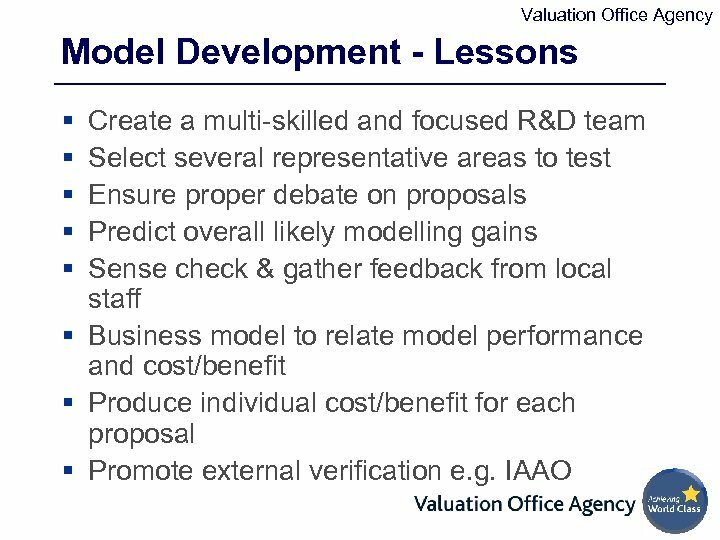 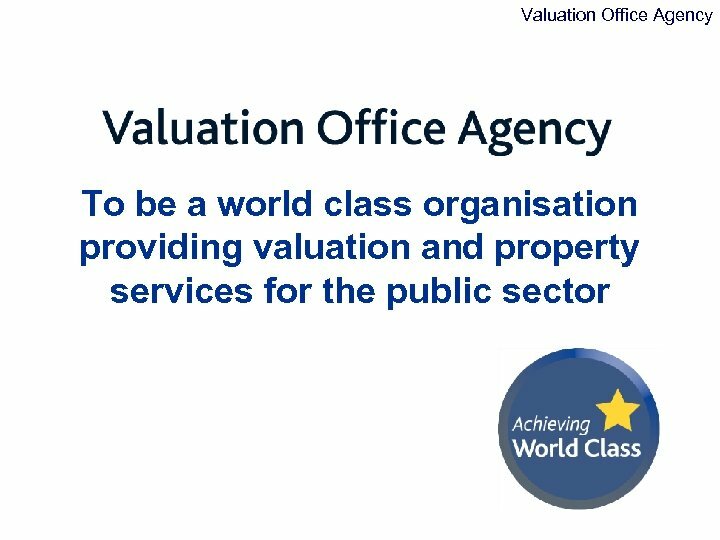 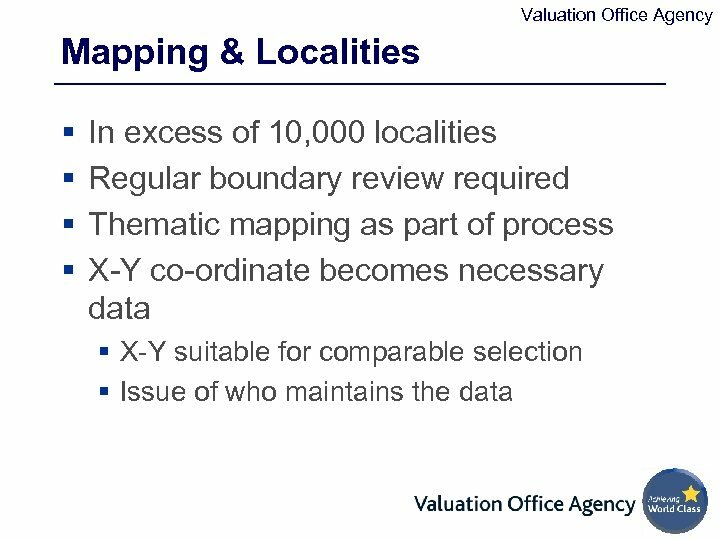 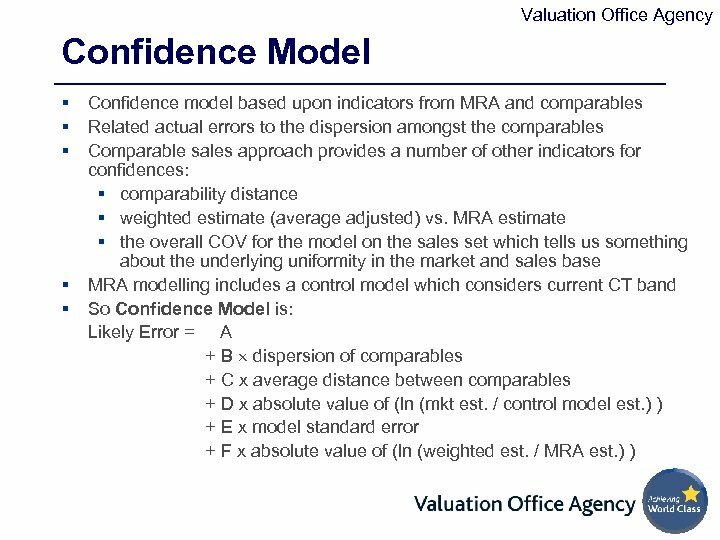 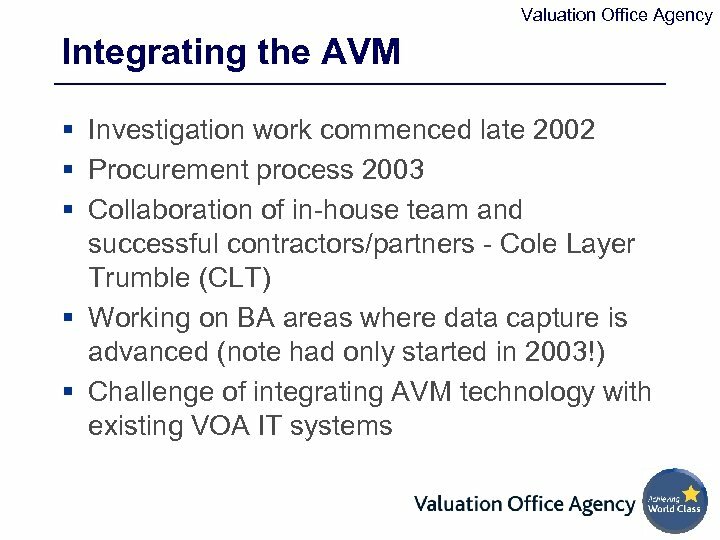 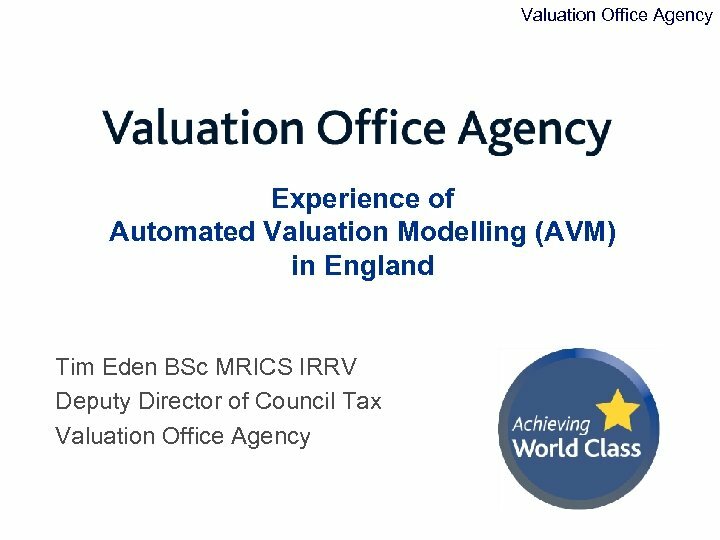 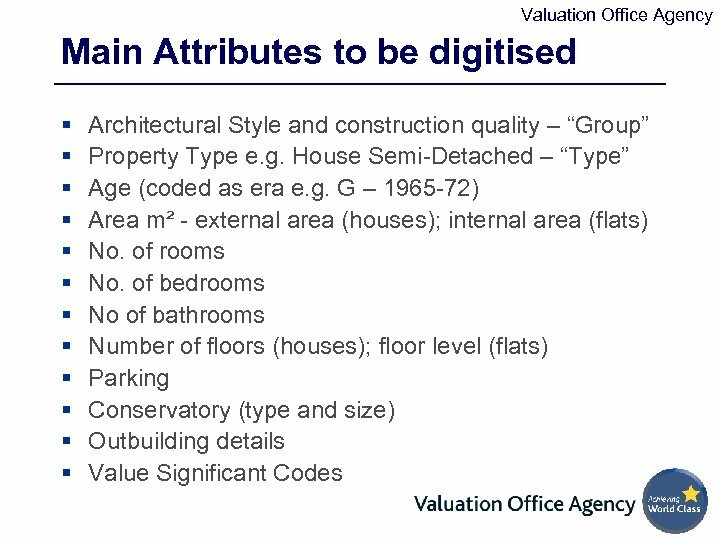 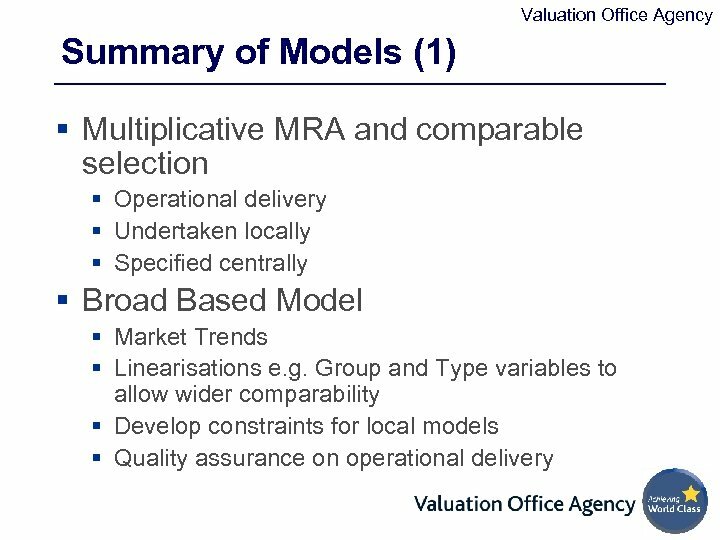 Valuation Office Agency Getting Started § Started with a simple additive model § £ = B 0 + B 1 * size + B 2 * Detached * Size + B 3 * Terraced * Size + … + Bn * Date of Sale * Size § 1993 Band initially used to support analysis, but quickly stripped out of valuation models § Postcode sectors used as proxy for location – VOA developed “localities” § Postal areas are too crude § Designed to support mail delivery, not to reflect influences on the property market! 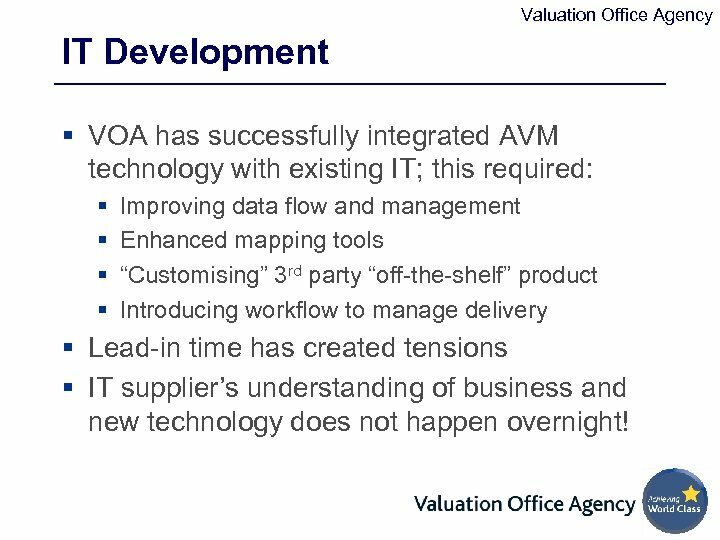 Valuation Office Agency IT Development § VOA has successfully integrated AVM technology with existing IT; this required: § § Improving data flow and management Enhanced mapping tools “Customising” 3 rd party “off-the-shelf” product Introducing workflow to manage delivery § Lead-in time has created tensions § IT supplier’s understanding of business and new technology does not happen overnight! 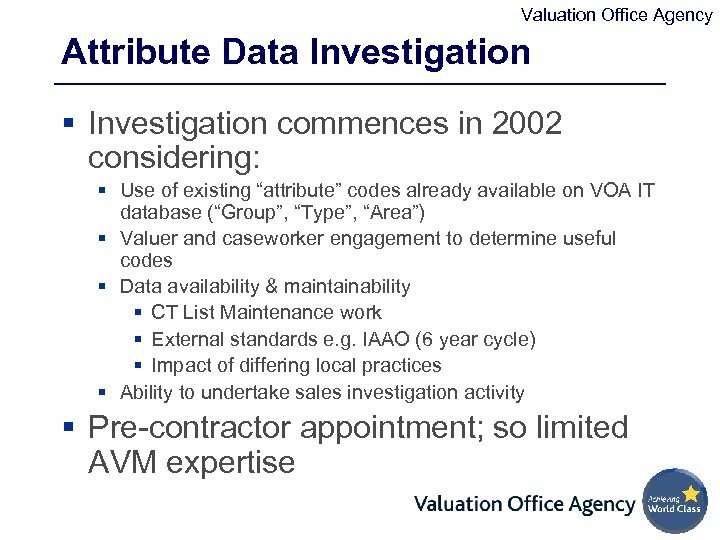 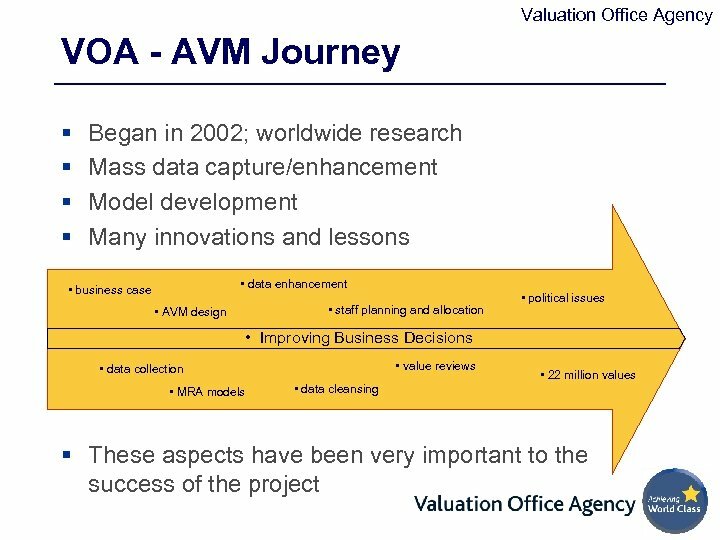 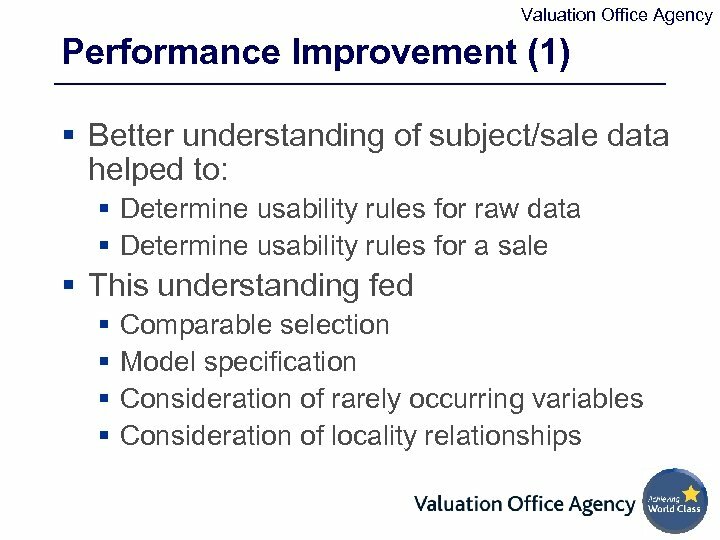 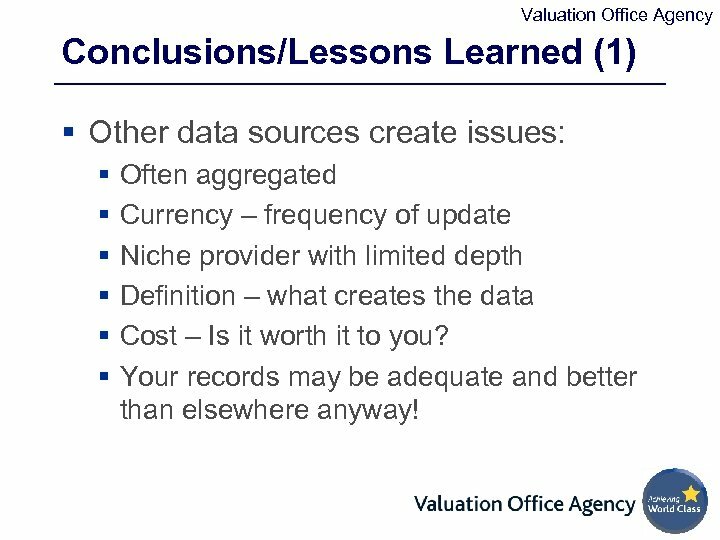 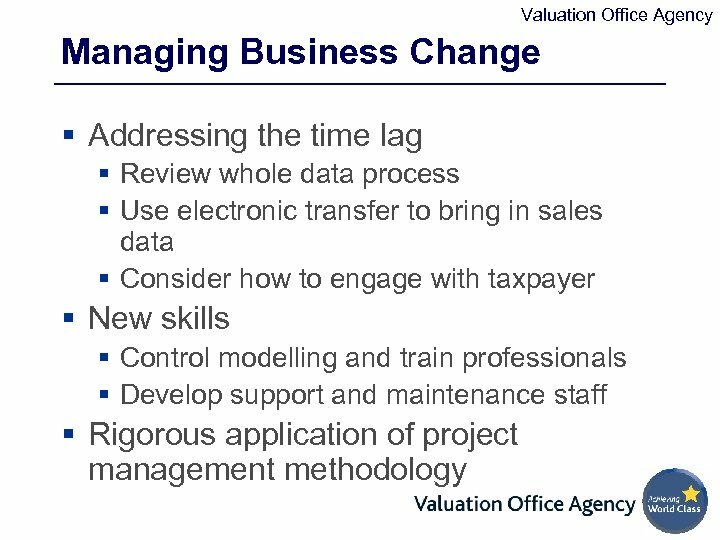 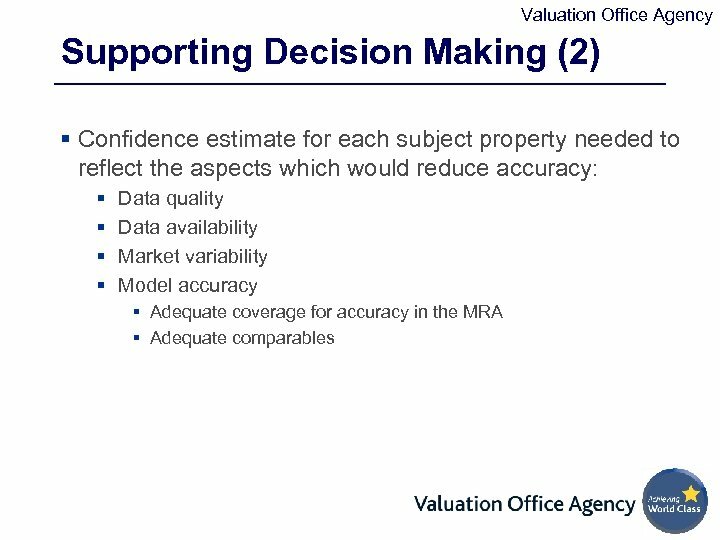 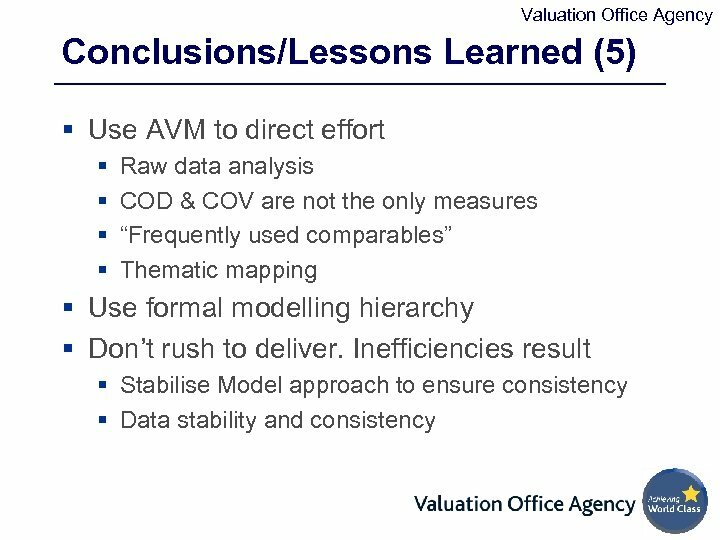 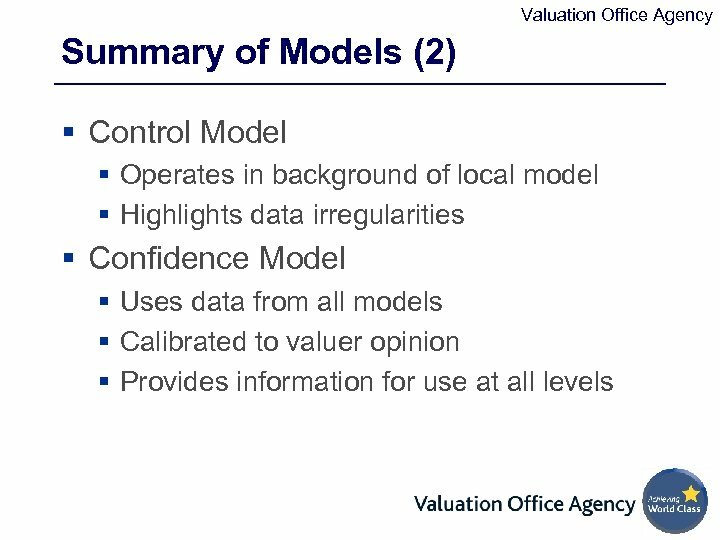 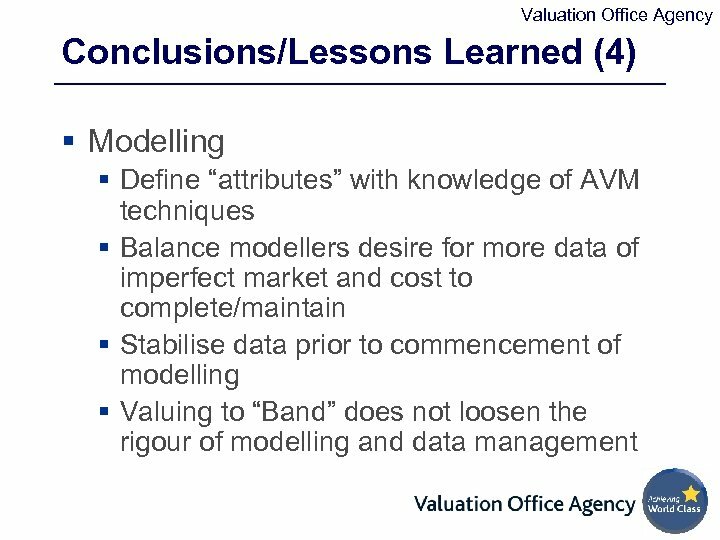 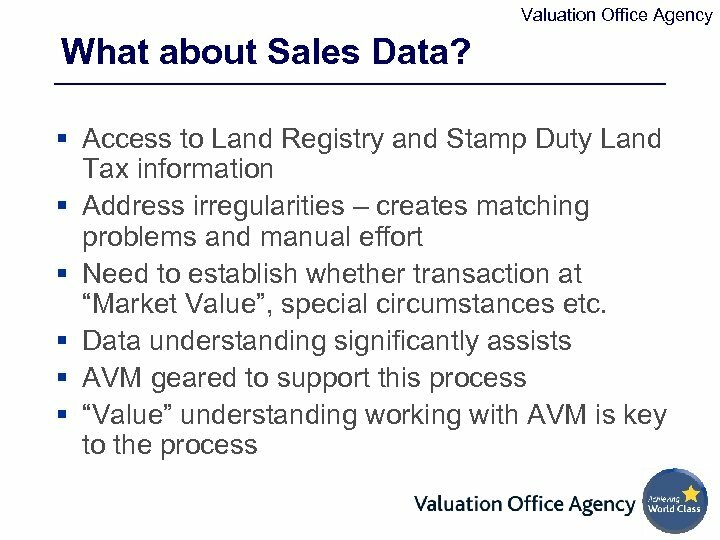 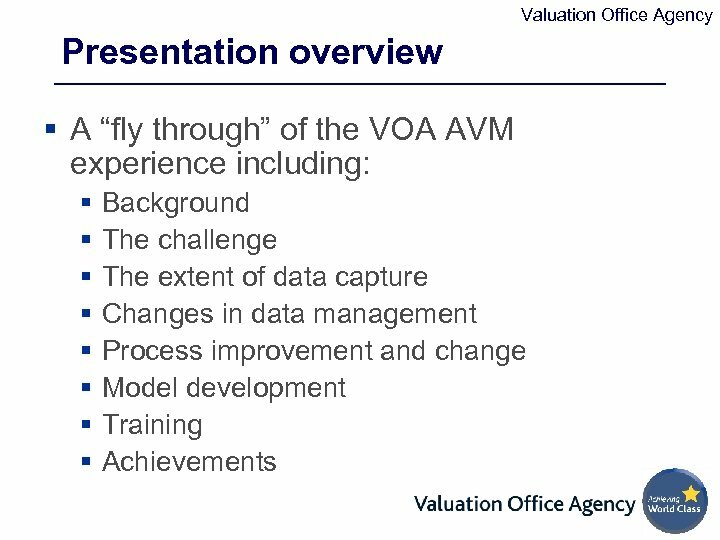 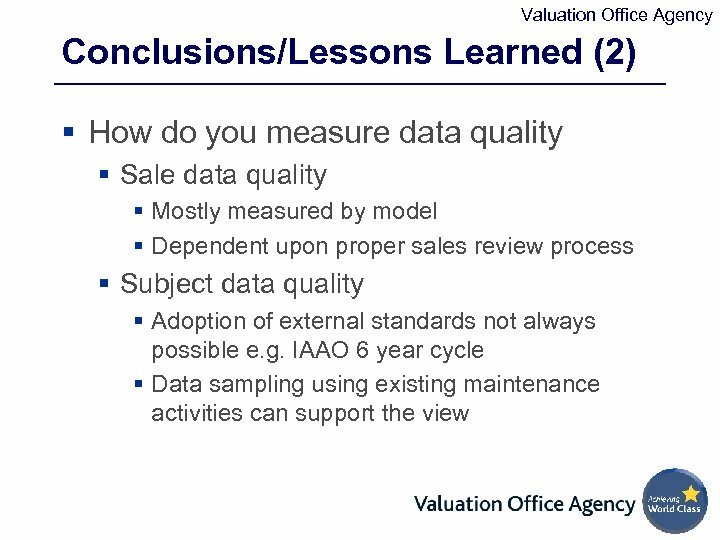 Valuation Office Agency Conclusions/Lessons Learned (1) § Other data sources create issues: § § § Often aggregated Currency – frequency of update Niche provider with limited depth Definition – what creates the data Cost – Is it worth it to you? 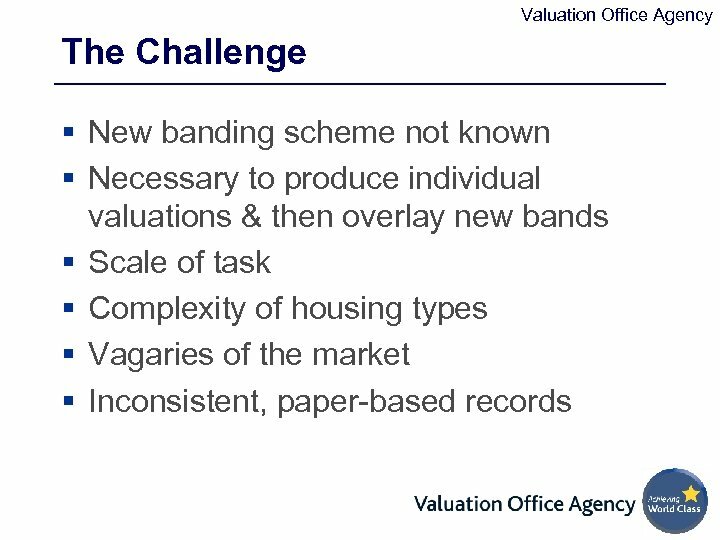 Your records may be adequate and better than elsewhere anyway! 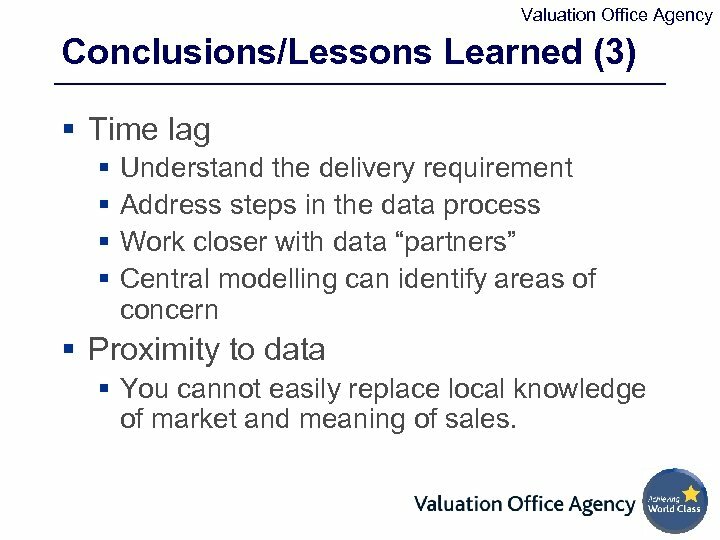 Valuation Office Agency Conclusions/Lessons Learned (3) § Time lag § § Understand the delivery requirement Address steps in the data process Work closer with data “partners” Central modelling can identify areas of concern § Proximity to data § You cannot easily replace local knowledge of market and meaning of sales. 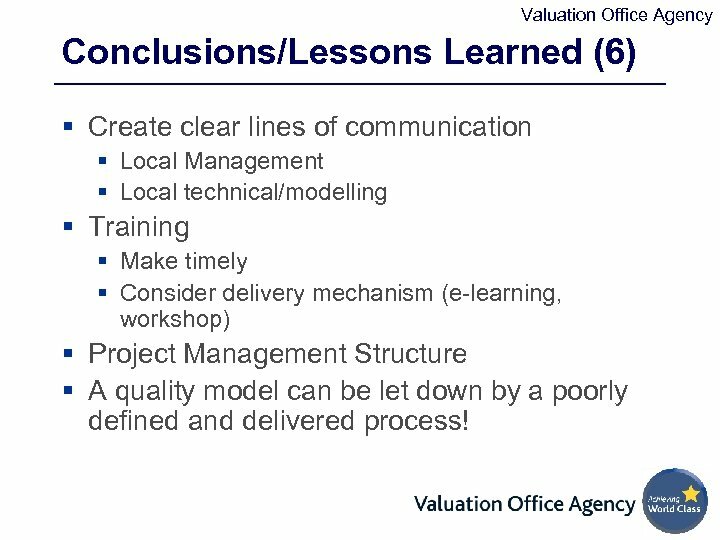 Valuation Office Agency Conclusions/Lessons Learned (6) § Create clear lines of communication § Local Management § Local technical/modelling § Training § Make timely § Consider delivery mechanism (e-learning, workshop) § Project Management Structure § A quality model can be let down by a poorly defined and delivered process! 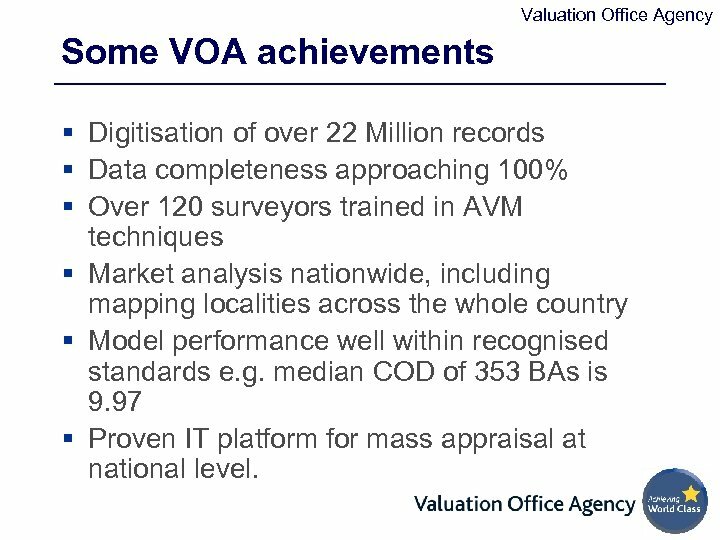 Valuation Office Agency Some VOA achievements § Digitisation of over 22 Million records § Data completeness approaching 100% § Over 120 surveyors trained in AVM techniques § Market analysis nationwide, including mapping localities across the whole country § Model performance well within recognised standards e. g. median COD of 353 BAs is 9. 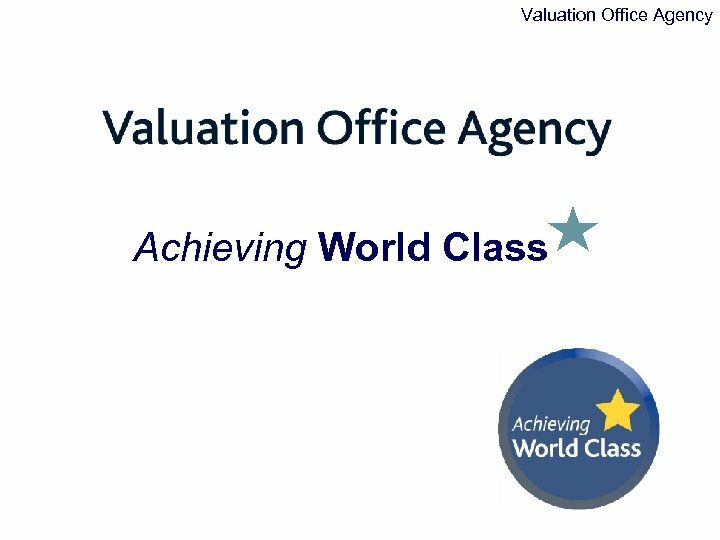 97 § Proven IT platform for mass appraisal at national level.